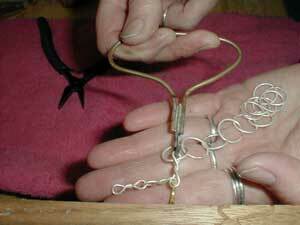 I am a silversmith, living near the foothills of the Adirondack Mountains. Below is a chronological account of my artistic career. 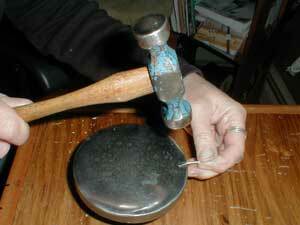 1977 - I learned to make jewelry from my parents, Butch and Pat Bramhall, the Stonehouse Silversmiths. My business continued for a few years until I had my children. 1981 - I learned to weave baskets from a friend and most of my first baskets were made from tree roots and vines that I wove into Appalachian style rib baskets. Eventually I became more interested in a finer, more precise weave and began using black ash splints, then reed that is commercially prepared. 1986 - I began teaching basketweaving classes several times a week. 1987 - An article that I wrote was published in the NEWS BASKET, a magazine for basketweavers and collectors. The basket featured in the article was made from twisted lily leaves woven over a grapevine frame. 1991 - I had an article published in the BASKETMAKER, this article was about the Adirondack pack basket and how to weave it. 1997 - The INTERWOVEN N.E.W.S. spring issue printed an article about my work as a basketmaker and teacher. 1997 - Most of my work was sold to shops and galleries ( including the Adirondack Museum) in the Adirondack region of New York state and throughout most of the New England states. My main focus for the 1990s was recreating the Adirondack style pack baskets and fishing creels. 1997 - L.L. Bean called me in September to order my small pack baskets for their 1998 Fall Home and Camp catalog, their buyer had seen my small pack in the gift shop at the Adirondack Museum, while on vacation. The pack was featured on the cover and I was kept busy throughout that year producing baskets for L.L. Bean, I even had to hire some help to fill the order. 1998 - The PACK BASKET CATALOG contacted me, they were interested in many sizes of my packs as well as the creel handbag and antler baskets. So the day I finished my contract with L.L. Bean I immediately began weaving for their catalog. I continued to do so until the catalog folded in February 2002. 2001 - The urge to make silver jewelry kept gnawing at me, I had so many designs in my head that I began playing around with silver again. 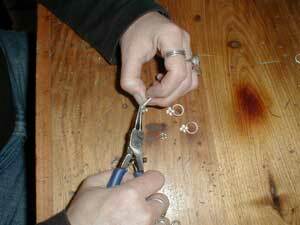 The overwhelming desire to create jewelry made me change my business from wholesale production basket weaver to retail jewelry maker during the winter of 2001-2002. 2002 - I made my last basket, and enjoyed the switch from baskets to jewelry very much. I attended several craft shows and farmers markets throughout the summer and fall. 2003 - My two grown sons, Josh and Jeremy, joined me in the business and continue to supplement my stock whenever they are able. Thankfully, when they were young, they had learned silversmithing from my parents and are able to help me meet my customers demands. Jeremy and his partner Meghan Staring live near Oneonta NY both work full time and make many of our chains in their spare time. Josh lives in Farmington NY and in 2010 started his own business ~ Josh's Jewelry, we are now all a part of Silver Bench Jewelry. Their diligence and creativity have been most helpful. 2010 - I won second place for jewelry at Colorscape Chenango Arts Festival in Norwich, NY. 2011 - Josh and I won first place for jewelry at Colorscape Chenango Arts Festival in Norwich, NY. 2012 - Blue Ribbon for best jewelry at Herkimer County Community College Art and Craft Fair in Herkimer NY. 2016 - Best of Show at Herkimer County Community College Arts and Craft Fair in Herkimer NY. 2017 - Blue ribbon for Jewelry at the North Country Art Council 42nd Annual Fall Art Show in Watertown, NY. 2017 - Award of Distinction at the Herkimer County Community College Art and Craft Fair in Herkimer, NY. My parents, Butch and Pat Bramhall, have been a huge influence in my life, their creativity and skills are unsurpassed in the metalsmithing business and I appreciate all their encouragement, knowledge, advice and inspiration. We are all pleased to be part of the tradition that includes three generations of our family.